(1) Rent a pontoon boat and go fishing on Big Bear Lake. 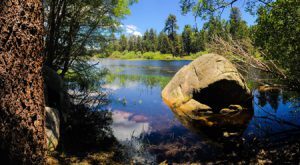 (2) Between May and November, find the hidden gem “Bluff Lake,” which is not very far from the Castle Rock Trail. Here are photos that my wife took of this area, and we only discovered it two years after we bought the Lovenest. As great as these photos are, the pictures don’t do the place justice! This is the entry from the back way…. easy to miss. Posted in Photos and tagged big bear, bluff lake by Rob and Marie with no comments yet. 17th Welcome to The Lovenest! 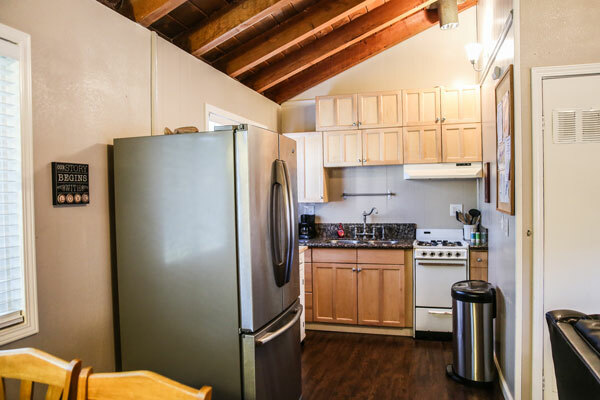 Nestled in a very quiet and peaceful area of Big Bear City – and only five miles east of Snow Summit – the 1BR, 1BA “Lovenest” boasts a beautiful fireplace, upgraded kitchen, Wifi, Roku, and a view of Gold Mountain. 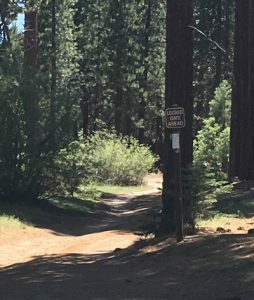 One of the best vacation bargains in the entire valley, keep that lovelight on fire with quiet strolls along the adjoining meadow where you can hold hands, breathe in the fresh air, and watch the horses play. 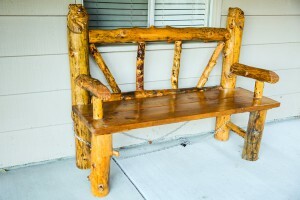 The “Lovenest” can comfortably accommodate four people. There is one queen bed in the bedroom, a futon sofa and sofabed couch in the living room, and a spacious backyard (and room for an RV). 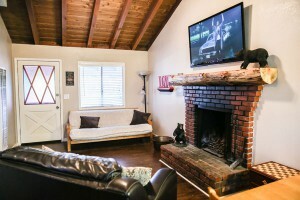 Posted in Property Description and tagged big bear, big bear cabin, big bear city, cabin, fishing trip, getaway, ideas, love, place to stay, romantic getaway ideas, romatic getaway, romatic weekend, skiing trip, vrbo by Rob and Marie with no comments yet. 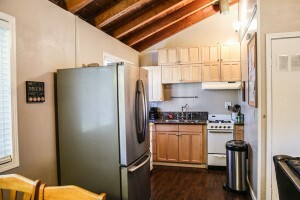 Our cabin contains a newer refrigerator that can comfortably accommodate all of your food. You can fill this fridge at the local Vons, which is stocked with everything you could want… including firewood. The kitchen area has a toaster, coffee maker, rice cooker, and a microwave. Utensils, glasses, mugs, pans, oven mitts, and other cooking materials are available for use with the stove and compact oven. We do NOT have cable television; however, we have free wifi and a Roku. Feel free to add Roku apps for your particular home cable system, which should allow you to stream television via the internet. 1) Netflix: feel free to utilize our Netflix subscription, which is available through the Roku. Hundreds of television programs and movies are available. 2) DramaFever: we are big fans of Korean dramas, so you can also take advantage of our subscription to DramaFever, available via the Roku. Ask us for suggestions on what to watch! 4) NFLnow: You can watch highlights, live, using this Roku app… feel free to use our subscription. There are previews of games and other NFL-related content, as well. On June 17, 2014, we added a charcoal BBQ in the back. On August 7, 2014, we added games! We have Yahtzee, Uno, Scrabble, Headbands, Checkers, Backgammon, and Dominoes, among others! In October, 2014, we upgraded our fireplace for heat efficiency (and the firebox was too big, which sometimes caused smoke to come into the cabin). In November, 2014, we added a cozy bench for hot cocoa on the porch! Posted in Property Description and tagged big bear, big bear city, cabin, getaway, lovenest, romance, romantic by Rob and Marie with no comments yet. We installed a new firebox... a wood burning insert for added safety and great efficiency. Here is a simple and straightforward method to get a fire started with it. Rob and Marie on Guestbook! Adrian & Julie Arellano on Guestbook!